Ask 37-year-old Bloomingdale resident and restaurateur, Tom Pantano, how he got into the pet food delivery business and you’ll get only a one word answer – Nala. In 2007, Pantano’s best friend Nala, a then 2-year-old Bull Mastiff, was a victim of a pet food recall that took thousands of pet’s lives across the country. Nala, whose kidney function deteriorated to less than 10%, was given a grim prognosis from her veterinarian. An entrepreneur by nature, Pantano decided he wanted to make the healthy pet food brands not only easily accessible but also, convenient and affordable. Pantano’s most popular products, which he is the first to tell you, are rich with healthy, organic ingredients such as meat, fruits and vegetables, include: Taste of the Wild, Fromm, Orijen, Nature’s Variety, Wellness, Blue Buffalo, Canidae, Royal Canin and a variety of raw food diets. Treats, accessories, toys, holiday gift baskets, gift certificate and more are also offered. Customers appreciate the free at-home delivery with an order of $35 regardless of weight. The website not only offers quality products and convenience, it includes monthly features from local animal experts on how to care for their pets. With the holidays around the corner, Pantano is asking PetFoodZoom.com visitors to vote on a local animal shelter that they would like to see receive donations from PetFoodZoom.com. in 2012. PetFoodZoom.com has a customer loyalty program which helps customers accumulate PetFoodZoom dollars that they can use on future purchases. Custom-designed feline and canine holiday baskets are available and can be hand delivered to your door to your favorite pet anywhere in the Chicagoland area. Visit www.PetFoodZoom.com to place and order or call 1-800-561- ZOOM (9666). You can also follow Pett Food Zoom and their friends on Facebook and Twitter. 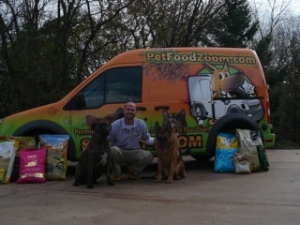 Tom Pantano, owner of PetFoodZom.com, delivers pet food and more to your door.